Some foreword: After the 3.0.0 patch came in, Assassin is in quite a bad spot. Nerfs to bleed/poison (DoT in general) and crit has made this ascendancy a less optimal choice, but I decided to give it a try. This is my attempt at reviving Assassin by using Dark Pact, and scale crit (obviously). 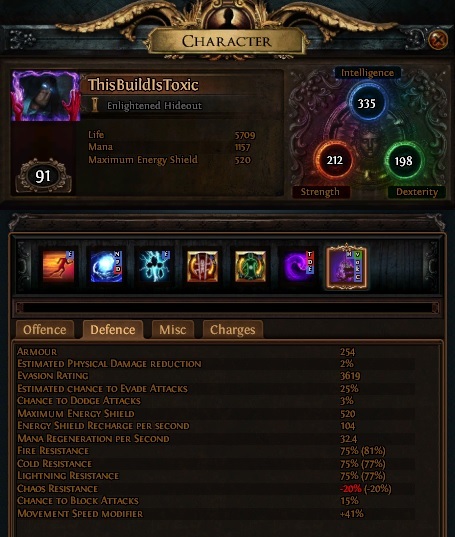 This is BiS for our build: power charges, spell damage, cast speed, crit? You can't get a better weapon. Dual-wield these babies to have maximum damage output. The only downside of using wands instead of dagger + shield is that our movement is really clunky (using Lightning Warp or Flame Dash), but with high movement speed + Quicksilver Flask + Kiara's, that shouldn't be much of a problem. Shields with good spell damage + crit + life are really expensive, and those with really good rolls only give us a marginal damage boost, so instead we opt for the much cheaper, budget Rathpith Globe. For dagger, prioritize: spell crit > spell damage > flat added spell damage > crit multi (I put crit multi last because spell daggers with the mod are quite expensive, but if you have the budget, don't hesitate). You can either dual-wield it or use with Rathpith Globe, but then you'd lose a lot of crit, which is the main purpose of this build, so use with caution. Get a rare with high life roll and resistance. 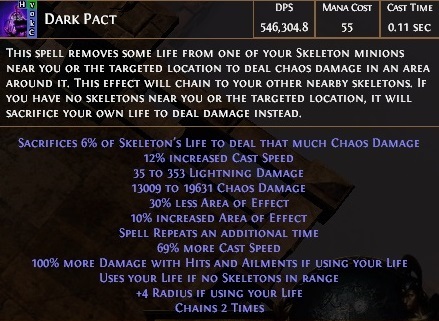 Best enchant for QoL and smoothness would definitely be: 12% increased Dark Pact Cast Speed. There has also been a dispute between an Evasion- or an Armour-based helmet. My best bet, if your resistances are capped, is to get an Armour-based, since they can roll Strength suffixes, and gives you more life and also damage. But they are 3-4 times more expensive than an Evasion-based last time I checked, so if you can't afford one, then get the other, basically not much to differentiate, just a lil' bit min-maxing here and there. Other options would be a Starkonja's Head with high life roll, but since we are quite tight on resistance, a rare would be better. Unquestionably BiS, gives everything you need, can't ask for anything else. Alternatives would be a rare, Belly of the Beast, or The Covenant. 2x Diamond Ring: more crit, more damage. 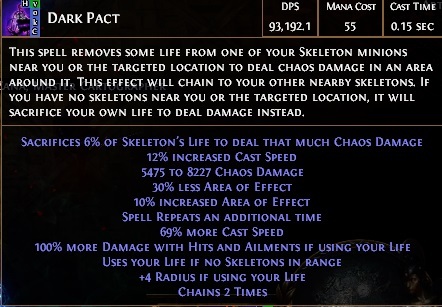 Slam some Essence of Envy for % Chaos Damage. Prioritize life and resistance on these. Rare amulet: Priority would be: Life > Crit Multi > Spell Damage > Resistance > Cast Speed. BiS would be a well-rolled Fingerless Silk Gloves for that sweet 16% Spell Damage implicit, but a rare with life and resistance on them works. If you use Shield Charge or Whirling Blades, some attack speed would also help. A Leather Belt for the most life, also easiest to get resistance on. Not much to discuss here. Another BiS for this build. Inya's Epiphany provides everything we need: Life, Damage, Movement Speed, and most important of all: "25% chance that if you would gain Power Charges, you instead gain up to your maximum number of Power Charges." This makes our PCoC setup super efficient, and ramp up our damage a million times faster since we are dual-wielding 2 Void Batteries. Alternatives are a rare boots with high life roll and resistance, or a pair of Atziri's Step. For bandits, either Alira or Eramir. Two passives are more versatile and useful towards late game imho. Anything works for us, but most of the time, I use: Solaris + Gruthkul for more defense, since we are pretty well-versed offensively already. Life Flask: to avoid certain death. Diamond Flask: it's a crit build, duh. Silver Flask: More speed, better clear. Atziri's Promise: for more reliable leech. Dying Sun will improve your clear speed by increasing the AoE of your Dark Pact (and also helps tanking that annoying Volatiles), but getting 2 AoE nodes on the passive tree + Increased AoE gem is enough for me so I opt for other flasks. This is still a very viable option. Use this if you want to be more defensive, especially against Minotaur and Chimera with their hard-hitting physical attacks. Kiara's Determination: I had issues where mobs stunned me and interrupted my DP cast, which means death, so this flask will counteract those pesky situations. Not mandatory if you're more skilled than I am and have a wide monitor that helps you see mobs before they approach you. If you managed to get the boots enchantment that avoids being stunned on kill, then opt for other flasks instead. If you have resistance problems then you can fill those gaps with jewels as well, but always prioritize life, it is your damage and your defense. This is by no means the most optimal gem setup. You can fit in a Vaal Haste, Vaal Grace, Lightning Warp, whatever you prefer. This is simply the setup that fits my playstyle and that I feel most comfortable with, so experiment around a bit! You can also try out this set-up: 3L: Herald of Ice - Onslaught - Increased AoE for those shattering enthusiasts out there, and a bit nudge for your clear speed. I leveled my Assassin with Dark Pact as soon as I can use it at level 28. The simple trick is to buy the gem in advance so that you won't have to wait until you completed the quest. But before that, you can level with Freezing Pulse or Magma Orb. Equip 2 Axioms, a Goldrim, a Tabula (+1 Socketed Gems corruption if possible), Seven-League Step (if you can afford one), a Karui Ward (for more movement speed and some projectile damage) and 2 -8 Elreon rings. In your 6L, add an Onslaught gem, it'll boost your movement speed even further. When you get your Dark Pact, you have two options: use it right away, or wait until you get your Blasphemy gem. Since Dark Pact uses your life to cast, and you'd need either leech or chugging your life flasks, and a Blasphemy Warlord's Mark would be your friend until the end. You can level with the setup I proposed until level 31, or you can use Dark Pact right away. I personally used Dark Pact and it was fine. Get Vaal Pact when you feel like you need it, or when you start leveling in yellow/red maps. The method is: cast your OoS on a pack, watch your Power Charges, kill the mobs if Power Charges are capped. Use OoS every 8s to proc Arcane Surge and sustain your charges. Flame Dash to move around, and slam those *thump-thump* Dark Pact. Map mods to avoid: Cannot Leech. Hexproof is doable but quite a nuisance, since you'll have to rely on Atziri's Promise for life leech, and Arcane Surge for mana regen. This is taken at hideout, no charges or flasks or any other buffs on. - Added some specifications to gear choices. - Showed off some math skills. - Replaced old gears with new, upgrades ones. - Still don't know how to colour. - Added a poorly-recorded gameplay. - Added a leveling guide. DPS looks great, as does the leach. How viable would Cherrubim's Maleficence be? Do you still have space to make up the resists, as the DPS is higher(9% on max roll), you gain some armour (not loads but I personally hate pure evasion for the one shots in red maps), slightly more evasion and life. Cherrubim's Maleficience is definitely viable, and exactly the first armour that came to mind when I made this build, but since it's Armour/Evasion-based, getting the right colour would be quite extravagant. I also like the AoE radius that Carcass Jack provides, and the resistance on it alleviates my strict gear choices. My jewelries are very damage-focused, so there's not much space to craft resistance on them, but if you feel like your damage is enough, get some decent rings with good life and resistance. Cherrubim's Maleficience is definitely viable, and exactly the first armour that came to mind when I made this build, but since it's Armour/Evasion-based, getting the right colour would be quite extravagant. I may have overlooked this minor detail. I mostly just really like the appearance of the armour and always a shame that it's not viable for more builds. Thank you so much! Glad to make a spot in the build list! You can level with Dark Pact as soon as you get it, or if you can afford a pair of Abberath's Hooves, it'll carry you all the way to Act 10. If you plan to use Dark Pact to level, bring 2-3 life flasks, a Diamond and a Silver flask, use 2 Axioms. Oh, and a Blasphemy Warlord's Mark set-up for reliable leech that you take with to end-game.